TV REVIEW Doctor Who 5.08 "The Hungry Earth"
Did the Doctor's encounter with Homo Reptilia make our blood run cold? The one where: A Welsh drilling project in the year 2020 disturbs some old acquaintances of the Doctor: the Silurians. Verdict: The Silurians’ 1970 debut is one of my favourite old Who stories, so I’ve been praying for their return for years. Sadly, I found this episode somewhat underwhelming. 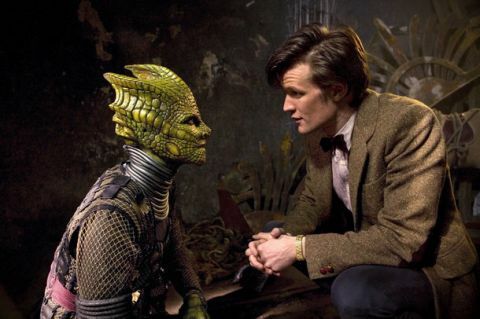 Let’s start with the Silurians themselves: the make-up is a beautiful piece of work, and it obviously makes sense making them look more human – modern viewers just won’t accept rubber masks, and this approach allows the actor to be fully expressive. Unfortunately it also renders them less distinctive, reminiscent of numerous other humanoid lizards we’ve seen in SF over the years. I miss their third eye . On the plus side: loving the innovation of that venomous tongue lash, and the way the costume nods to the “string vest” look of their marine cousins the Sea Devils. I suspect this episode might work better for casual viewers. For clued-up fans who know what’s coming, there’s a rather long wait for the Silurians to turn up. Having a countdown to their arrival creates extra frustration, rather than tension. It feels like a very under-populated tale, too: there’s a major drilling project run by two people, a village inhabited by one family, and (for the most part) just one Silurian. A minor carp, this: some of the scripting feels clunky. “Flaming door, always sticking!”, for starters. And Rory’s concern that Amy might lose her engagement ring doesn’t ring true at all, coming across as a contrived way of reminding us of their relationship status/temporarily splitting them up. On the plus side, there are some wonderfully creepy notions here, liable to give kids the heebie-jeebies, such as people being sucked into the Earth, and live vivisection. The sequence where young Elliot is pursued through the darkened graveyard by Alaya is rather marvellous. And the character moments between the Doctor and the boy are excellent. Best bit: The Doctor’s anguished response to seeing Amy dragged beneath the earth. Bravo, Matt Smith. Influences: There are several familiar plot elements from old Who stories. People were sucked down under the ground in 1984’s “Frontios”, the drilling project is straight out of 1970’s “Inferno” (indeed, there doesn’t seem to any particularly good reason for them to be drilling so deep, other than that that’s what happened in “Inferno”), and the force shield over a small village recalls 1971’s “The Daemons”. Nitpicks: As someone forgiving of Doctor Who ’s attitude to science, I can just about buy the idea that you can set up a sensor grid by waving the sonic screwdriver at a load of phones, cameras and burglar alarms. What I don’t buy is the idea that the Doctor and co have a working system up and running in less than four minutes . It’d take longer than that for them to find the equipment and gaffer-tape it in place. Why don’t the Silurian warriors (or rather warrior) have weapons? And why do Alaya’s fellow warriors leg it the moment she’s bundled into the back of a van? As warriors go, they’re not much cop if they don’t think they can take on a handful of unarmed humans. Why does everyone keep going on about Amy being inappropriately dressed? If anything, she’s over-dressed for Rio - she’s wearing a leather jacket and a jumper, not a bikini! It's wossisname! : The face of Robert Pugh (Tony) will ring bells for Torchwood viewers. He appeared in season two’s “Adrift”, as Jonah , who was swallowed up by the Rift and returned 40 years older. Trivia: In reality, a Russian scientific project has drilled over 12km into the Earth. Speculation: So, which of the humans do we think will end up fulfilling Alaya's prediction by killing her? It could be Tony. That Silurian venom might send him do-lally. And it was Tony (rather amusingly, given that he’s a drilling expert, not a surgeon!) who suggested dissecting the Silurian to “find its weak points”. But I reckon that’s too obvious – that’s what they want us to think. I’m putting my money on Elliot’s mother, driven by a desperation to get her son back.